This series came to the 22nd part now. I wish to finish the series since I feel that I have talked out about important "Nikon Family Cousins". Nevertheless, there are many products that I gave up to pick up due to various reasons. Some lack material to talk and some are too realistic to talk. This time I want to make brief comments on some of them. Just after started this series, my acquaintance Mr. X requested to take up this camera. 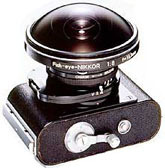 This camera, released in 1957, was equipped with a fisheye lens that was the ancestor of later Fisheye Nikkor and used 120 (6 x 6 cm) format film, one of very few example among Nikon Cameras. In that sense, it was a very interesting camera, but I gave up to take it up because there was too little material. In this series, I try to include the fact which cannot be got through the study of written records only. It was easy to include such facts if I myself was engaged in the development or, otherwise, I was in a position to obtain the information in the period when the development was proceeding, but in other cases, especially about the products of the time before I joined the company, I had to interview seniors who actually took part in the development in order to get such information. However, I couldn't trace such seniors regarding this "Fisheye Camera". But I could look into the prototype. The camera itself was very simple, and the film winding stopper mechanism, for instance, was very smartly designed. It was mentioned about this camera including the circumstances of the development in "Digital Archives" in this web page, please refer to that. Nikon L35AF, released in 1983, was the first lens shutter camera (compact camera) with direct optical view finder of Nippon Kogaku K.K.. The reason of entering into that market, the circumstances of its birth and a unique naming of "Pikaichi" ("top notch" in Japanese) are very interesting. Descendants of this camera were much talked about its appointing a popular actress as the TV CF character. As recent relatives, there appeared even "High class compact cameras" such as Nikon 35Ti QUARTZ DATE (1993) and Nikon 28Ti QUARTZ DATE (1994). Even now, many of descendants of Pikaichi are active in the market. Looking such a situation, I feel that it's too early to talk about the episodes of Pikaichi as legends. As time passes, I may have an opportunity to take this up willingly. Please let me defer the matter to that time. The world's first and only SLR type underwater camera NIKONOS RS was released in 1992. Until then, divers took underwater pictures with an ordinary SLR housed in the water-tight case called "blimp". NIKONOS RS not only made the blimp unnecessary, but it built up its original system including unique interchangeable lenses such as underwater fisheye lens and underwater zoom lens. But its life was too short. Even now, several years after the discontinuation, popularity of this camera never falls among divers. I believe some time in the future I may talk about the episode about its birth and so on, but at the moment, I give it up to pick this up, waiting for a favorable opportunity. At the time of starting this series, I put the title "Nikon Family Cousins" in the sense that I take up cameras out of the main stream, so to speak, cameras corresponding to a branch family instead of a main family. In that sense, not the camera itself but various accessories of Nippon Kogaku K.K. (present Nikon corporation) may be, as it were, "second cousins". There are unique ones among these "second cousins". Motor Drives that wind up the film by electric power existed from the time of such rangefinder cameras as Nikon S2 (1954) and Nikon SP (1957). Many may know about the details of them as they were explained in many books and magazines. Likewise, Speedlights were also developed early in Nippon Kogaku. The first one was SB-1 (1969) that was clip-on type and following SB-2 (see photo) and SB-3 were clip-on type and improved to the serial-control automatic flash exposure control type. It is not well known that the Speedlight of Nippon Kogaku that realized serial-control automatic exposure control in about the earliest period. 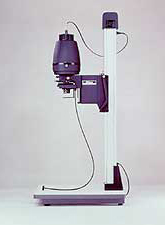 In 1975, monochromatic enlarger Nikon Enlarger RA-350 Autofocus was released. It was based on the conception, "If Nikon participates in the photographic industry, Nikon must be responsible for overall quality of photograph playing a part in the procedure after shooting", but it was not successful as business. These are only a few examples and there are so many interesting items among Nikon's camera accessories. We may have an opportunity to talk about these "second cousins". It seems that the original aim of "spotlighting ill-fated cousins" has been attained, though there remains some regret. Thanking you for reading it for long time, I put down my pen.